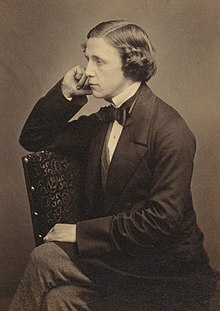 Charles Lutwidge Dodgson (27 January 1832 – 14 January 1898) was a British author, mathematician, Anglican clergyman, logician, and amateur photographer, more famous under the pen name Lewis Carroll. His father was Charles Dodgson (archdeacon), his great-grandfather was Charles Dodgson (bishop) and his nephew was Stuart Dodgson Collingwood. The White Knight must not have whiskers; he must not be made to look old. "You have no mind to be unkind,"
The `Why?' cannot, and need not, be put into words. Those for whom a child's mind is a sealed book, and who see no divinity in a child's smile, would read such words in vain: while for any one that has ever loved one true child, no words are needed. For he will have known the awe that falls on one in the presence of a spirit fresh from GOD's hands, on whom no shadow of sin, and but the outermost fringe of the shadow of sorrow, has yet fallen: he will have felt the bitter contrast between the haunting selfishness that spoils his best deeds and the life that is but an overflowing love--for I think a child's first attitude to the world is a simple love for all living things: and he will have learned that the best work a man can do is when he works for love's sake only, with no thought of name, or gain, or earthly reward. No deed of ours, I suppose, on this side the grave, is really unselfish: yet if one can put forth all one's powers in a task where nothing of reward is hoped for but a little child's whispered thanks, and the airy touch of a little child's pure lips, one seems to come somewhere near to this. To Her, whose children's smiles fed the narrator's fancy and were his rich reward: from the Author. If you want to inspire confidence, give plenty of statistics – it does not matter that they should be accurate, or even intelligible, so long as there is enough of them. "And at last we've got to the end of this ideal racecourse! Now that you accept A and B and C and D, of course you accept Z." (E) If A and B and C and D are true, Z must be true. Until I've granted that, of course I needn't grant Z. So it's quite a necessary step, you see?" But surely you trust God! Do you think He would let you come to harm? To be afraid is to distrust. As you have invited me, I cannot come, for I have made a rule to decline all invitations; but I will come the next day. And said "You must not ask." Doth never say thee nay. As Men to fear the dark. We call him the INN-SPECTRE. Serves but to let the dusk in - "
Who pinned his faith on Ruskin!" And so I tell you flat. They gave us for our tea. Or you've a grand digestion! To knight him on the spot. The West is the fitting tomb for all the sorrow and the sighing, all the errors and the follies of the Past: for all its withered Hopes and all its buried Loves! From the East comes new strength, new ambition, new Hope, new Life, new Love! Look Eastward! Aye, look Eastward!" Fading, with the Night, the memory of a dead love, and the withered leaves of a blighted hope, and the sickly repinings and moody regrets that numb the best energies of the soul: and rising, broadening, rolling upward like a living flood, the manly resolve, and the dauntless will, and the heavenward gaze of faith — the substance of things hoped for, the evidence of things not seen! "Look Eastward! Aye, look Eastward!" Some American writer has said “the snakes in this district may be divided into one species—the venomous”. The same principle applies here. Postage-Stamp-Cases may be divided into one species, the “Wonderland”. Imitations of it will soon appear, no doubt: but they cannot include the two Pictorial Surprises, which are copyright. You don't see why I call them 'Surprises'? Well, take the Case in your left hand, and regard it attentively. You see Alice nursing the Duchess's Baby ? (An entirely new combination, by the way : it doesn't occur in the book.) Now, with your right thumb and forefinger, lay hold of the little book, and suddenly pull it out. The Baby has turned into a Pig I If that doesn't surprise you, why, I suppose you wouldn't be surprised if your own Mother-in-law suddenly turned into a Gyroscope! Put the date in full. It is another aggravating thing, when you wish, years afterwards, to arrange a series of letters, to find them dated "Feb. 17", "Aug. 2", without any year to guide you as to which comes first. And never, never, dear Madam (N.B. this remark is addressed to ladies only: no man would ever do such a thing), put "Wednesday", simply, as the date! Here is a golden Rule to begin with. Write legibly. The average temper of the human race would be perceptibly sweetened, if everybody obeyed this Rule! A great deal of the bad writing in the world comes simply from writing too quickly. If doubtful whether to end with “yours faithfully”, or “yours truly”, or “your most truly”, &c. (there are at least a dozen varieties, before you reach “yours affectionately”), refer to your correspondent’s last letter, and make your winding-up at least as friendly as his: in fact, even if a shade more friendly, it will do no harm! God has given to Man an absolute right to take the lives of other animals, for any reasonable cause, such as the supply of food; but He has not given to Man the right to inflict pain, unless where necessary. "Our Second Experiment", the Professor announced, as Bruno returned to his place, still thoughtfully rubbing his elbows, "is the production of that seldom-seen-but-greatly-to-be-admired phenomenon, Black Light! You have seen White Light, Red Light, Green Light, and so on: but never, till this wonderful day, have any eyes but mine seen Black Light! This box", carefully lifting it upon the table, and covering it with a heap of blankets, "is quite full of it. The way I made it was this - I took a lighted candle into a dark cupboard and shut the door. Of course the cupboard was then full of Yellow Light. Then I took a bottle of Black ink, and poured it over the candle: and, to my delight, every atom of the Yellow Light turned Black! That was indeed the proudest moment of my life! Then I filled a box with it. And now - would anyone like to get under the blankets and see it?" Dead silence followed this appeal: but at last Bruno said "I'll get under, if it won't jingle my elbows." Satisfied on this point, Bruno crawled under the blankets, and, after a minute or two, crawled out again, very hot and dusty, and with his hair in the wildest confusion. "What did you see in the box?" Sylvie eagerly enquired. "I saw nuffin!" Bruno sadly replied. "It were too dark!" "He has described the appearance of the thing exactly!" the Professor exclaimed with enthusiasm. "Black Light, and Nothing, look so extremely alike, at first sight, that I don't wonder he failed to distinguish them! We will now proceed to the Third Experiment." But large hot tears were coursing down her cheek. I mark this day with a white stone. 19 December 1863; he frequently used this or a similar phrase for especially notable days. This is a paraphrase of statement in a thank you note from Carroll to a childhood friend, the actress Ellen Terry, published in Ellen Terry, Player in Her Time (1997), p. 126 by Nina Auerbach: "... and so you have found out that secret — one of the deep secrets of Life — that all, that is really worth the doing, is what we do for others?" He had a curiously womanish face, and, in direct contradiction to his real character, there seemed to be little strength in it. Lewis Carroll is somebody who wore different hats. He was a clergyman, a mathematician, a teacher. He wrote serious books, and amazing children's books. He was a photographer. So like most people, he was many people in one skin. Creatively, he made a greater impact than almost any other Victorian, and yet we know next to nothing about him, we just fall back on the old cliché. We lament that we cannot go home again, cannot be a little child once more, and Lewis Carroll's works have enabled us to deny that reality momentarily, to indulge our dreams for one bright interval. It is not children who ought to read the works of Lewis Carroll; they are far better employed making mud-pies. He made pets of the most odd and unlikely animals, and numbered certain snails and toads among his intimate friends. He tried also to encourage civilised warfare among earthworms, by supplying them with small pieces of pipe, with which they might fight if so disposed. His notions of charity at this early age were somewhat rudimentary; he used to peel rushes with the idea that the pith would afterwards "be given to the poor," though what possible use they could put it to he never attempted to explain. One day, when Charles was a very small boy, he came up to his father and showed him a book of logarithms, with the request, "Please explain." Mr. Dodgson told him that he was much too young to understand anything about such a difficult subject. The child listened to what his father said, and appeared to think it irrelevant, for he still insisted, "But, please, explain!" Lewis Carroll's humour is that of an educated man; it is fun indeed, but of the most refined and exotic. And that is why his books, popular as they are and as they deserve to be among children, can only be fully appreciated by grown-up readers. Such were the lucidity of exposition and his mastery of the topic that it seems possible that, had he ever published it, the political theory of Britain would have been significantly different. He was preoccupied with left and right, as with right and wrong. Mr. Dodgson had a mathematical, a logical and a philosophical mind; and when these qualities are united to a love of the grotesque, the resultant fancies are sure to have a quite peculiar charm, a charm so much the greater because its source is subtle and eludes all attempts to grasp it. Sometimes he seems to revel in ideas which are not merely illogical but anti-logical. It was a soufflé of a speech, light, pleasant, digestible, and nourishing also. As one who was a boy for much of his adult life, he was by our standards something of a fuddy-duddy in his youth. Except for the straw boater for the river outings, a top hat was always worn and gloves carried. I shall always remember his beautiful twinkling eyes, full of love and laughter, as he told us wonderful stories. And how Lewis Carroll loved the country, the woods, and the hay, and wove into his magic stories the flowers and animals we saw there! Sitting with his back to a big tree-trunk, with one of us on his knee – sometimes one on each knee – he would tell us for hours, stories of the Pixies. And every time he came, he had fresh adventures to relate. Sometimes our friend’s face looked, when in repose, very sad and worn, and very different from the fun-lit face, with its charming eyes, that we saw when he was telling us those magic tales – tales which seem to have been woven right into the fabric of my life, and to have coloured it always with a tinge of his dreams. In a stroke, Carroll anticipated key elements of multiple alignment, minimum distance alignment and local alignment that are now central to biological sequence analysis. Dodgson’s stammer was a good deal under control and could be used defensively (to gain time), or rhetorically to enhance the effect of a story, when the point was near. It may be taken as axiomatic that whatever Dodgson was thinking and feeling at the time found its way into his 'nonsense'. My beloved friend - one of the most unique and charming personalities of our time. His imaginatively posed photographs of children are a delight, and his hundreds of photographs of friends and celebrities provide us with much insight into the Victorian world around him. Those of us who knew him best remember him as the kind and loving friend, who contributed so much to the happiness of our lives, and whom we shall truly mourn as one of the best of men. Never, surely, did any man make more friends among children than he did. It was impossible for Mr. Dodgson to pass by the smallest opportunity of speaking to a child, and his winning manner gained the hearts, and generally the tongues, of all whom he met. In his estimation, logic was a most important study for everyone. No pains were spared to make it clear and interesting to those who would but consent to learn of him. The arrangement of his papers, the classification of his photographs, the order of his books, the lists and registers that he kept about everything imaginable - all this betokened his well-ordered mind. Everything that he did must be done in the most perfect manner possible; and the same care and attention would be given to other people's affairs, if in any way he could assist or give them pleasure. Mr. Dodgson had a great horror of being "lionised," and ingeniously silenced his tormentors by representing to them, indirectly, that "lewis Carroll," the author of "Alice," and "Mr. Dodgson" were two separate persons. Never was there a more delightful host for a "dinner-party," or one who took such pains for your entertainment, fresh and interesting to the last. With all his humour he took a serious view of life, and had a very grave vein running through his mind. The simplicity of his faith, his deep reverence, and his child-like faith in the goodness of God were striking. Mr. Dodgson did not often preach, yet, when he did, he had the power to impress and captivate his hearers. There was no need for him to write out a sermon. Full of earnestness in his subject, the words came without difficulty. Neither was there any danger of his wandering from the direct point, for before the eye of his ordered and logical mind, his subject would arise in the form of a diagram to be worked out point by point. Charles, trapped in the cave of his period, was the laughing philosopher who could show others the way out. He spoke the language and played the role of Ariel - the mantle of Prospero ill became him, though he fancied it. Cramped by his own charts, on a stream itself restricted, his genius directed him to the bottomless ocean of his books, and impelled him to dive under the graciously sparkling surface into the dark swirl of the icy depths. Rich deposits of perversity crop up in his humor - and his sudden attacks of virtue or sentimentality midway through his own or other persons' jests hint that his imp has suggested to him something particularly unfunny and unpardonable. "Did all those famous people really have epilepsy?" by John R. Hughes. Department of Neurology, School of Medicine, University of Illinois at Chicago. Epilepsy & Behavior, Volume 6, Issue 2, p. 115 - 139. March 2005.